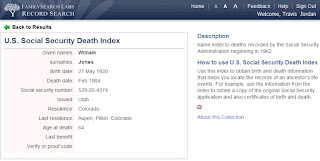 June 19th, FamilySearch Labs quietly announced Record Search, the product that will make it possible to access microfilm from the organization's Granite Mountain Vault, and to search the indexes produced by FamilySearch Indexing. Sample's of how the product might look were posted as well, allowing us to give you a look at this momentous new product. Keep in mind, however, that this is a "pilot" program--not even ready for beta testing. Anything is subject to change. 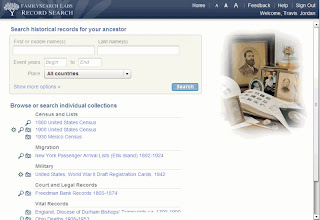 The first image, below, shows a current incarnation of the Home Page. (Click each image to see a larger view.) Some collections can be searched, some can be browsed, and some allow both. 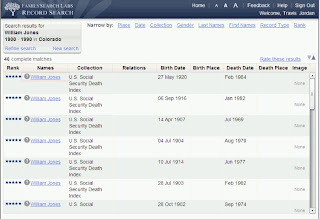 More information about Record Search is available in a post on DearMYRTLE.